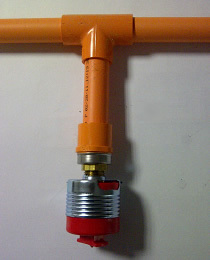 A typical fire sprinkler installation will use CPVC pipe work and concealed fire sprinkler heads. The pipe work and sprinkler heads are installed in accordance with the design drawings. The pipe work is secured to the structure and glued together with solvent cement. It is preferable for the fire sprinkler heads to be fitted as part of the first fix, to allow for pressure testing of the whole system, prior to it being closed up by ceilings/floors. Each sprinkler head is fitted accurately to ensure the sprinkler cover plate sits flush to the finished ceiling. 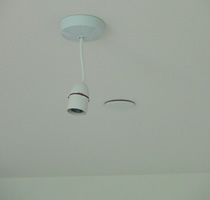 A minimum ceiling void of 150mm is required when concealed sprinkler heads are installed. 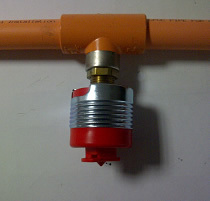 The above shows a sprinkler head fitted using pipe work to drop the head to the desired level. 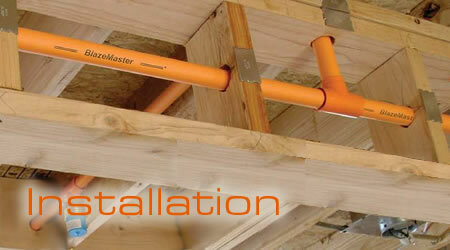 This is the most desired option and can be used to fit sprinklers in a ceiling void from 150mm and upwards. The above is a method we would use when we have a limited ceiling void. The minimum void required is 105mm. When the pipe work is secured and the fire sprinkler heads fitted, the entire system is wet pressure tested to 8bar. 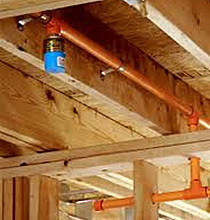 Every joint is visually inspected for leaks and the system left under pressure until it is connected to the water main supply or fire pump set. The fire sprinkler heads are left with a plastic rubber protective cap. The centre of this cover has a point which will mark the plasterboard to allow the correct size hole to be cut. Once the ceilings are fitted and decoration complete, the protective covers will be removed and the sprinkler head decorative cover plates are fitted.